3” diameter dust take-off with actuated butterfly valve vents displaced air. Bag inflation system includes air amplifier and a 4” diameter actuated butterfly valve for maximum fill volume. 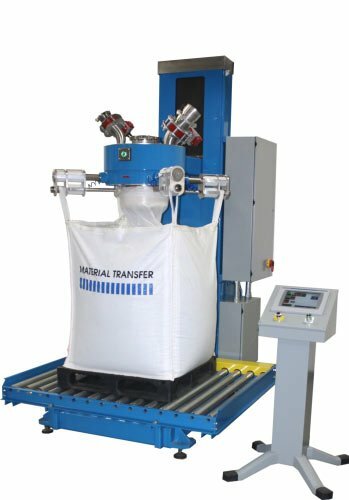 Hydraulic Power-Lift™ system with VFD positions fill head for ergonomic bag connection. Inflatable spout seal is actuated by a push button switch conveniently located on the fill head. Unit includes a 50” wide powered roller conveyor in filler base with fixed speed drive. Pallet sensing photocell interlocked to disallow fill cycle start unless pallet is present. Remote Allen-Bradley PLC controls with a color Panelview operator interface provide easy access to system status, recipes, and operational parameters. 8” diameter fill valve (not shown) with bulk/dribble/trickle controls for accurate weighments.